World Beat Connection ministers through music in Minnesota, the Caribbean, and Latin America by blending styles from a variety of cultural, ethnic, and geographical backgrounds. 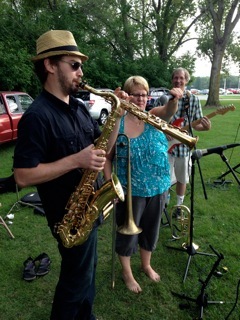 Concerts are given by vocalists and instrumentalists in Minnesota who volunteer their time to raise money for United Methodist and other charities. Once or twice a year, World Beat Connection organizes and sponsors a musical tour of another country or region of the United States. Recent trips have been to Costa Rica, Jamaica, and New Orleans. Musicians from each country or area join the team as well as others from across the country. Funds are raised in each country or area for local ministries. Future plans include trips to Dominican Republic and Haiti. All are welcome to join. The team meets once each fall and spring. World Beat Connection has performed hundreds of concerts over the past 10 years and is an expansion of Jumping Jehosafats, another music group which has been doing the same kind of ministry since 1985.